A Grandparent’s Gift of Memories is a kind of workbook for passing on personal memories that reflect the grandparent’s values and faith. Yet workbook is not an apt description unless the work is understood as a labor of love. This “work” is the pleasant exercise of responding to simple questions by recalling the past and writing down recollections within the book. While this is not a scrapbook in size or design, a grandmother or grandfather could paste photos and memorabilia illustrating her or his memories on the lined pages designated for reflections. “Pilgrimage” might seem an unusual word in the book’s subtitle, but it is apt. A pilgrimage is a religious journey, especially one to a shrine or sacred place. Life memories are precious, sacred even, and a person’s travel back through time can be a holy journey to a sacred place. Sharing blessed memories with a grandchild is like traveling with the young person to a holy place, and rightly called a pilgrimage. Merriam-Webster adds an alternative definition for pilgrimage as “the course of life on earth.” This book fosters a grandparent’s reflection on his or her course of life as a prelude to retracing major steps with a grandchild. 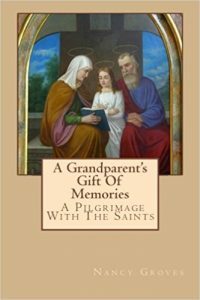 The book presents one or two saints for each stage of life as companions for both generations on the journey. Instead of a Table of Contents, the book lists “Chapters of My Life.” Chapters include Beginnings, Childhood, Youth, Education & Vocation, Marriage, Family, Friendships, Joys & Challenges, Beliefs & Virtues, and On Becoming a Grandparent. Each chapter opens with the brief story, pertinent dates, and an illustration of the model saint (or two) for a significant life moment or theme. The page concludes with at one or more quotations from Scripture. Subsequent pages, headed “Reflections,” pose questions such as “Where were you born?”; “What are favorite memories of your youth?”; “What memories do you have of your wedding day?”; “What virtues in your Catholic faith do you hold dear to your heart?”; “What is the greatest gift of faith you hope to pass on to your grandchild?” Lengthy answers are not required and space allowed ranges from half to a full (6” x 9”) page. This is Nancy Groves’ second book. She does not advise how to use this book, but I know how I intend to use it. I am going to spend prayerful time reflecting on the questions and writing my responses into the book. As each of my grandchildren becomes old enough, I will spend special time sharing from what I have written down and conversing about their own experiences, their dreams, and the saints they want as friends. Mary Ann Paulukonis shares her faith and her love of books, art, cooking, and gardening with six grandchildren. Marriage is full of growth and transition.